Looking for a durable, high-quality camping cot? We think we have a good option for you! You probably would want a camping cot that would work during the years to come. Affordable models cannot satisfy that requirement because they are often built of lower quality materials that do not live long. Sometimes, spending $30 on a cheap camping cot is the same as throwing your money out of the window. On Teton Sports Outfitter XXL cot review, we are going to examine a model that suffers from neither of those issues. What’s so great about Outfitter XXL? Who should buy it? What do other users think about it? We are now going to answer all these questions so you get an idea what Outfitter XXL is about! Q: Is It Primarily For Camping Or Can It Be Used For Other Purposes? Q: Do You Need To Add A Little Padding Or Is It Comfortable On Its Own? Q: Does It Have Any Odor? Q: Is There A Tent Attachment For This Cot? Outfitter XXL truly is a huge camping cot: measuring 85 x 40 x 19inches, it has enough length for even 6’12”-tall individuals. 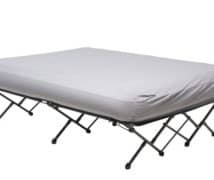 This camping cot is also wide enough to be comfortable for even those who move around a lot in their sleep. Finally, Outfitter XXL stands 19 inches above the ground, which will be especially convenient for those with mobility issues. At the base of Outfitter XXL is a frame built from extruded aluminum, which is both durable and rust-resistant. The frame not only allows for the amazing support of up to 600 lbs. but also ensures great stability during sleep. The S-shape legs of Outfitter XXL are made from reinforced steel. Apart from being tough, the legs feature rubber bushings to help the legs absorb shocks for more firm and comfortable support. In addition, the ends of the legs are covered with plastic to ensure that the floor in your home or in the tent doesn’t get accidentally damaged. The top of Outfitter XXL is built from a heavy-duty 600D brushed polyester canvas. While the choice of durable 600D fabrics is quite common with camping cots, what stands out with the cover of Outfitter XXL is its incredible sleeping area. 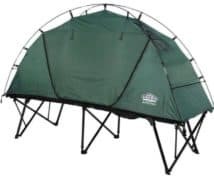 You could further enhance your experience with Teton Sports Camp Pad, a foam sleeping pad, or some other kind of equipment offered by the manufacturer. After the initial assembly, you don’t need to make much effort to set up and put away Outfitter XXL. That’s because it has a two-fold design! When folded, Outfitter XXL measures 42 x 12 x 7 inches, making it rather convenient for storage and transport. Weighing 26 pounds, this camping cot isn’t exactly lightweight, but the included storage bag should allow you to carry it around easily. Outfitter XXL is designed for those who are looking for a long-use camping cot. With this model, you can be sure that it won’t break down after several months. In addition, Outfitter XXL is ideal for those who have the budget because this model isn’t really affordable. Lastly, this camping cot is ideal for those who absolutely need large sleeping area. We feel that the main benefit of XXL is its size. While the cot itself is truly strong, barely anyone will need those 600lbs of max supported the weight. What people could find a use for however is the length and the width of Outfitter XXL. It has a lot of room, after all! You wouldn’t find such a large camping cot if you were looking for an affordable model. Teton Sports offers a lifetime warranty for Outfitter XXL. 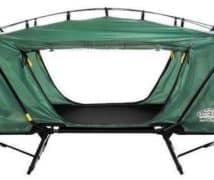 The features of this camping cot make it an exceptionally good choice for the price, so the lifetime warranty is an undeniably pleasant bonus. After all, you are paying about $100 for Outfitter XXL, right? The customer support offered by Teton Sports is worth a compliment as well. 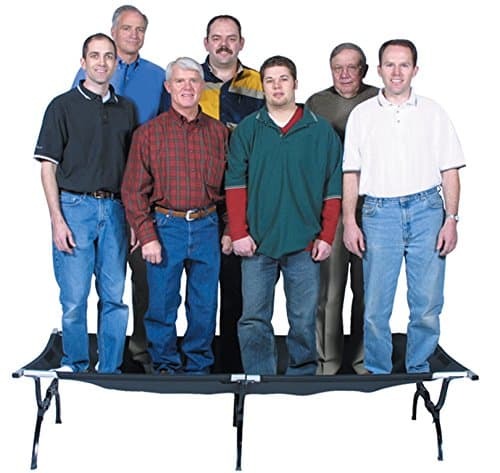 There have been some people who received faulty Outfitter XXL cots, but they have easily managed to get a replacement or alternatively request a full refund. Wide and long.Ideal for those who need large sleeping area. 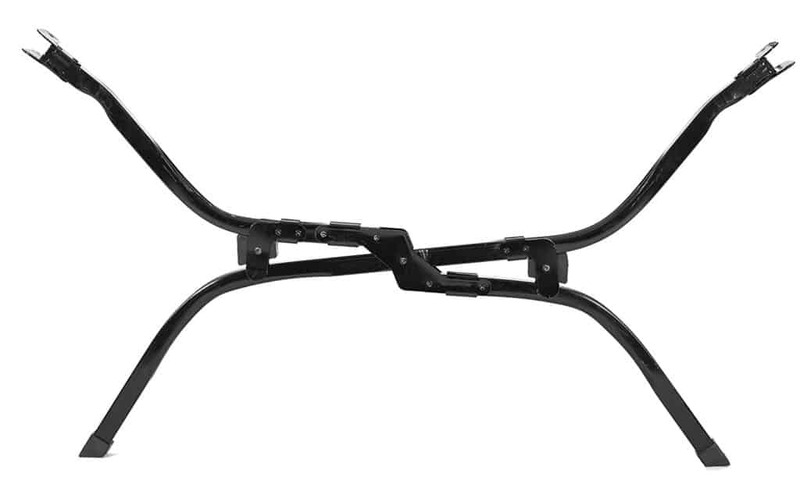 Strong aluminum frame for longevity and rust resistance. Reinforced steel legs with rubber bushings for sturdy and stable support. Withstands up to 600 lbs. Plastic-covered ends of the legs ensure the safety of flooring. Durable 600D brushed polyester top. Two-fold design and compact folded dimensions. Comes with a storage bag for easy carry. Compatible with various Teton Sports products. The included carry bag is low-quality. Heavy, though the weight isn’t surprising if you take the size of the cot into account. The initial assembly may take some time and effort. The end bars aren’t locked in place. Sellers and manufacturers can write whatever they want in their product descriptions, so the best way to objectively learn about a product’s quality is user reviews. And with Outfitter XXL, they have been quite positive! The first thing the buyers of Outfitter XXL praise is its grand size. Average people could comfortably stretch out in Outfitter XXL and freely move around in it. Some users even found that this camping cot is wide enough to comfortably accommodate two people! People also loved the quality of the materials of Outfitter XXL. Besides, the fact that Outfitter XXL can be enhanced with other Teton Sports products was also a subject of praise. 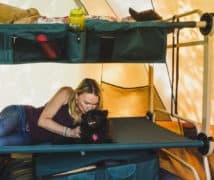 As for complaints, users generally didn’t like that the end bars do not lock into place, rendering the camping cot not as secure as they would like. Another sad thing about Outfitter XXL is that the included carry bag is poor-quality and doesn’t accommodate the camping cot very well. A: While it is designed for camping, you can add a small mattress topper and use it on the lawn or as a temporary bed for guests. A: If you fail to add a topper, comfort is not guaranteed. A: You may smell the synthetic material that the canvas is made off when you put your nose on the top part, but the odor is insignificant and unnoticeable when you are relaxing. A: Unfortunately, this product doesn’t come with a tent attachment. Did our Teton Sports Outfitter XXL cot review give you an idea of what we meant in the beginning? Outfitter XXL is a great model well worth its money, and you can be sure that it will work for quite a long time. Still not sure if Outfitter XXL is a good choice? Well, do you want to pay good money for a good product once or do you want to get a cheap model that could break down almost instantly? Just read some of the reviews on affordable camping cots. Most of them will have some faults making them not very reliable. That’s why we think that buying something like Outfitter XXL is the best possible option, given that you have the budget. I own this cot, have you used it? The reason I ask are the cons and a few things aren’t quite right. The end bars do lock and my carry bag has been in use for 5 Years now. Overall good review, just curious if you used it. Hi. Very interesting article but it’s hard to find outdoorspider.com in google. Thanks For your concern. Really !! is there anything free in this world?